OSWEGO – Staff at St. Luke Health Services in Oswego showed their support for the Oswego County Humane Society and their efforts at providing animal welfare services in the community. 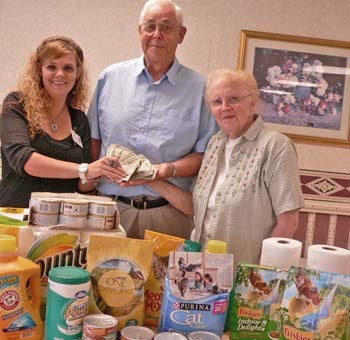 From left are: St. Luke Health Services Volunteer Coordinator Nicole Greenier with a variety of items and money collected from St. Luke Health Services employees on behalf of the Oswego County Humane Society. Accepting the donation is George and Carol Darling, Humane Society representatives. St. Luke staff made the donation to be used by the Oswego County Humane Society in its mission of providing public education and care to animals in need. By donating items for use by the Humane Society, employees were able to “dress casually” during a recent staff development day.